You are at:Home»Investment and Finance»Economics»Dollar strengthening – new trend or a fraud? The 30th of October. FOMC Statement, as it was expected, no Taper, everything remains unchanged. As I was saying for the whole week, I am pretty sure about the dollar getting weaker, but… So, why the dollar is strengthening instead? Strange, isn’t it: the stats facts are low, beneath the expectations, but the dollar is still pretty strong versus AUD, NZD, GBP, CAD. The exception is EUR – the dollar is little flat, trying to break 1.38 point. Let’s take a look further backward. The government shutdown in the United States and Debt ceiling increase. One good joke comes into my mind. Probably, U.S. decided to take the second option. The 18th of the December. Next FOMC Statement and Economic Projections. I’m not expecting any radical changes in QE3 before that date. Talking of the meeting – it’s not likely they are going to shut the program down, maybe only Taper. Janet Yellen becomes The new head of the Federal Reserve. What her new politics will bring is hard to say, I don’t see it clearly by now. 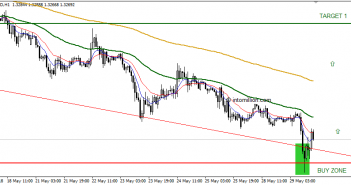 Drop down – technical correction, which was essential. Remember Bank of Japan meeting in June. Hiroki Kuroda didn’t bring anything new to the table, kept the program of printing money unchanged. However, that fact was a support for JPY. Today’s case looks like a fake drop down. It is used to persuade some of the traders and markets to buy the dollar. Logically – to buy you need someone to sell, but when everyone is buying there is no other way to move forward. As for me personally, the dollar is not my interest at the moment. Talking honestly, I am afraid of making predictions at this point. There are rumors on ECB won’t let EUR grow strong on the dollar on 1.40. Still, rumor is a rumor. However, it’s more than likely to see GBP/USD, EUR/USD growths above local averages. Taking into account EUR/GBP forecasts 83.00, from several banks, GBP has good chances to be top foreign exchange in an upcoming year.